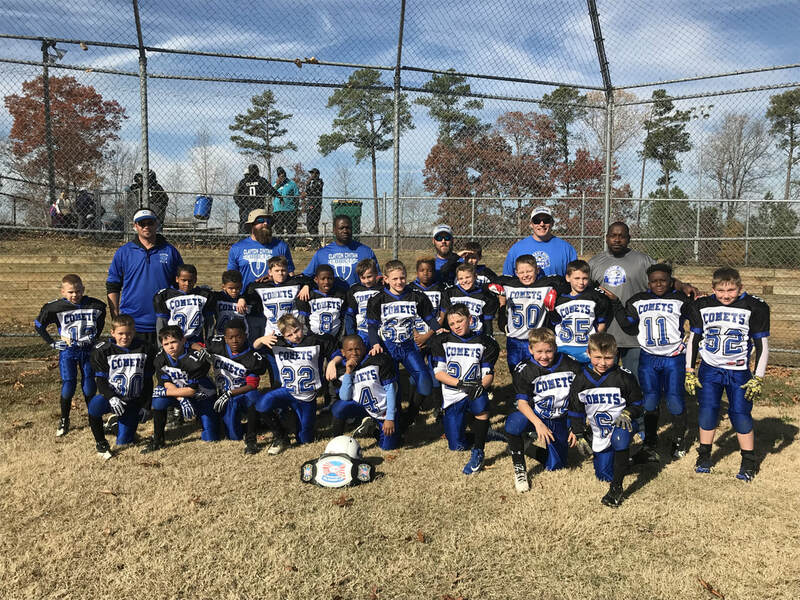 Clayton Civitan offers full contact football and cheerleading for youth athletes ages 6-12. We also offer a flag football program and cheerleading for youth ages 4 - 6. The 2019 season begins August 5, 2019 and will continue into November 2019 (depending on season record and playoff berth). EWFL Game Day Locations & Field Addresses - find addresses for all fields in the league. This rule is enforced within the East Wake Football League and is mandatory for all players - no exceptions. Read the EWFL press release. Proof of Physical Examination - All players must provide proof of a physical examination using the following form (or similar proof from a physician's office). Mandatory Physical Conditioning - The first week of practice will be geared towards physical conditioning. All players MUST complete a week of physical conditioning prior to full contact. Multiple-Child Discount - Families registering multiple children for the same Civitan program will receive a $25 discount for any additional children registered for the same program. For example, two football players in the same family receive a $25 discount for the second child registered. This applies to tackle football, cheerleading and flag football. Civitan Member Discount - All Clayton Civitan members will receive a $40 discount at the time of registration. All cheerleaders ages 6-12 are eligible to cheer at the Clayton Civitan. Participating cheerleaders will be assigned to either the Blue or White division and will cheer at those divisional games, including games where the Blue & White football teams travel to other fields. Siblings of players may be assigned to the same division. Cheerleading starts July 30 and will run until the end of the football season (November). Each cheerleader will be given a cheer uniform, hair bow and briefs. Please note: Cheerleaders are not required to have a picture ID or physical examination. All participants age 4-6 as of August 1 are eligible to play flag football. Our flag football program is designed to be instructional and fun. Practice - We will practice every Tuesday evening from 6:30 - 8PM. Games will be played on Saturday mornings around 9:00 AM. What do you need? Clayton Civitan will provide all necessary equipment and game jerseys. All players should have a pair of cleats with rubber soles (no metal cleats allowed). 2019 Flag Schedule - Coming Soon!